We can call the state of Andrapradesh as the �Land of Narasimha�- the man-lion form of Lord Vishnu. It is unique that only Andra Pradesh can boast this much number of Narasimha temples; an interesting aspect to be studied by both from the religious and historical aspects. Among the many Narasimha temples that dot the state, Sri Varaha Narasimha temple at Simhachalam, near Visakhapattanam is the most important one. It is said, this is the second richest Hindu temple in Andhrapradesh. It attracts devotees from all over the Eastern and Southern India throughout the year. Here, the original idol of Narasimha is covered by sandal paste, around the year. Legend is that this is so because the Narasimha form of Lord Vishnu is ferocious (ugrarupi) by nature. So, in order to cool down his anger, the sandal paste is applied. According to the Bhagavatha Purana, Lord Vishnu took the man-lion form to kill the demon Hiranyakashipu and to protect his devotee Prahlada (the demon�s son). However, on the Akshayatritiya day every year, the sandal paste on the idol is removed and one can see the original man-lion form of the idol in standing position. This is an important festival that attracts lot of people to this temple. The temple is on a hill top that forms part of the Eastern Ghat amidst lush greenery. Devotees take Giri Pradakshina (circumbulation) around this hill (about 40 kilometers stretch!) as an offering to the Lord Narasimha. Historically, the earliest historical reference on this temple (so far) is from the Chola period. The famous Chola King Kulotunga Chola made several contributions to this temple in 1098 AD. This is followed by patronage of the Ganga kings of Orissa and Vijaya Nagara rulers. The architecture of the temple is a mix of Orissan and Dravidian style. 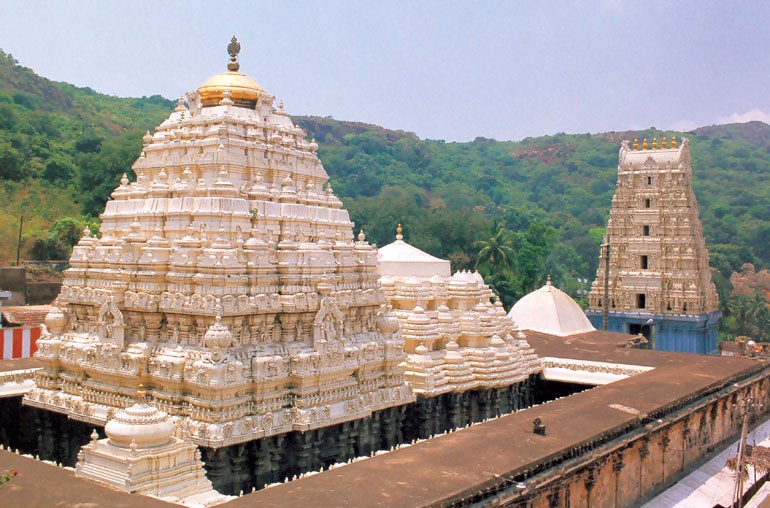 Simhachalam is 18 kilometers from Visakhapattanam.